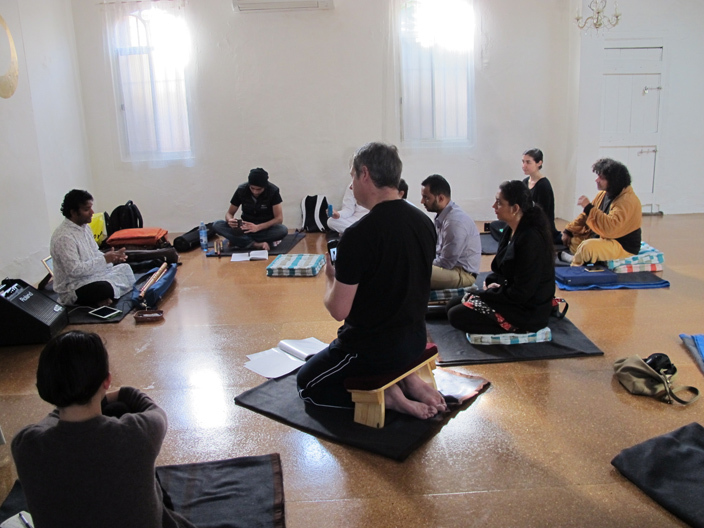 A master of Indian classical music flutist Vinod Prasanna conducted a music workshop in Brunswick East to a group of Melburnians eager to learn Indian music. The intensive workshop included teaching concepts of Indian music and how they are applied in today’s music scene. The workshop covered the basics of using the Bansuri (bamboo flute), vocal Indian singing, table (Indian rhythm system) and how to improvise. Born into one of India’s greatest flute-playing families, award-winning bansuri (flute) virtuoso Vinod Prasanna shines as an outstanding performer of authentic traditional and contemporary Indian music. Vinod’s emotive melodies, exquisite improvisations and divine flute song distinguish his performance of Indian classical, world and meditation music. Simply, Indian music at its finest. Currently residing in Australia, Vinod is a performing and recording artist, teacher, craftsman and ambassador of the Bansuri. Vinod has more than 17 years of performing and teaching experience and continues a family legacy that celebrates more than two-and-a-half centuries of Indian music.